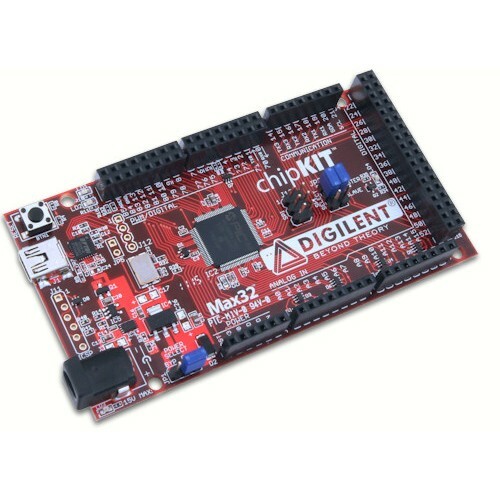 The chipKIT™ Max32™ is based on the popular Arduino™ open source hardware prototyping platform but adds the performance of the Microchip PIC32 microcontroller. The Max32 is the same form factor as the Arduino Mega board and is compatible with many Arduino™ shields as well as larger shields for use with the Mega boards. It features a USB serial port interface for connection to the IDE and can be powered via USB or an external power supply. The Max32 can be programmed using an environment based on the original Arduino™ IDE modified to support PIC32. In addition, the Max32 is fully compatible with the advanced Microchip MPLAB® IDE and the PICKit3 in-system programmer/debugger.